PROC FREQ uses scores of the variable values to compute the Mantel-Haenszel chi-square, Pearson correlation, Cochran-Armitage test for trend, weighted kappa coefficient, and Cochran-Mantel-Haenszel statistics. The SCORES= option in the TABLES statement specifies the score type that PROC FREQ uses. The available score types are TABLE, RANK, RIDIT, and MODRIDIT scores. The default score type is TABLE. Using MODRIDIT, RANK, or RIDIT scores yields nonparametric analyses. 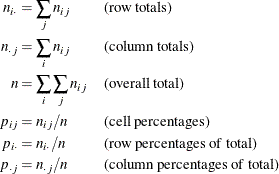 For numeric variables, table scores are the values of the row and column levels. If the row or column variable is formatted, then the table score is the internal numeric value corresponding to that level. If two or more numeric values are classified into the same formatted level, then the internal numeric value for that level is the smallest of these values. For character variables, table scores are defined as the row numbers and column numbers (that is, 1 for the first row, 2 for the second row, and so on). where is the rank score of row i, and is the rank score of column j. Note that rank scores yield midranks for tied values.